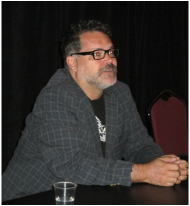 Aaron Douglas originally tried out for the Apollo role on Battlestar Galactica. He got a call back to read for Gaida but was glad not to get that role because of all the techno-babble. “I was the odd man out,” says Douglas. There just didn’t seem to be a role for him. Chief Tyrol was supposed to be the same age as Colonel Tigh. However, those casting the show looked at the crew and thought that they had a lot of old guys. Douglas was able to land the part of Chief because he was younger. Douglas found out about Tyrol being a Cylon about three months before the rest of the cast. “I may be a bit of a snoopy McGee,” says Douglas, who was visiting Michael Rymer’s home when he found papers he wasn’t supposed to see. The real life reactions were the same as the reactions that the actors gave in character. “It was a shock,” says Douglas. One thing that he changed about the story was the way that Cally dies. “Chief’s got to kill her. He’s got to purposefully kill her,” says Douglas. He also adlibbed sending the Chief to the Highlands in Scotland. Check out Shad Engkilterra’s YouTube channel for a video playlist of the convention. Check out StudioFantasma’s YouTube channel for more from Stephen Romney. Smart Bomb brings characters to life. Salt Lake Comic Con 2013: A(n unofficial) look at 'The Hobbit' sequel! Salt Lake Comic Con 2013 starts off with a bang!